A forklift certification allows for extensive employment and financial opportunities. After receiving your initial forklift certification, you’ll need to renew your certification through a recertification program after three years. This is due to the fact OSHA regulations and guidelines may have changed from the time of the initial certification. To ensure are guidelines and regulations are met to reduce workplace injuries, the recertification programs are necessary. In order for forklift operators and employers to remain complainant with OSHA standards, renewal is essential. If it’s approaching the time to renew your certification, CertifyMe offers a convenient forklift recertification program that can often be conducted at your place of employment. By completing the recertification program, you’ll be better prepared to handle hazardous situations without the risk of expensive OSHA citations. After completing the recertification program, you’ll receive your new valid certification the same day. There are other times when recertification may be necessary, even before the 3 year period has expired. For instance, if a forklift operator has been found to be operating in an unsafe manner or had any harmful incidents, they may be required to complete a renewal. In addition, should an employer change their safety regulations, a renewal of the certification may be needed. By renewing your certification under these circumstances, you’ll help ensure a safer working environment. 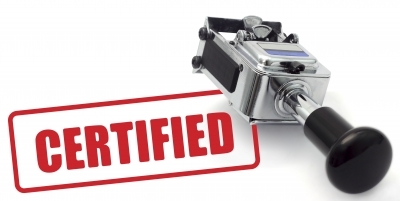 By contacting CertifyMe, you’re able to renew your forklift certification no matter what the reason. A valid certification is essential as unexpected OSHA inspections can lead to serious consequences, not to mention the safety risk factors involved. It’s estimated, 70 to 90 percent of workplace forklift injuries are the result of operator negligence and error. You can reduce this risk by staying current with your certification. Failure to renew your certification can result in fines from OSHA ranging from $7,000 to $70,000. Stay safe and avoid OSHA penalties by getting started today with CertifyMe.net’s 3 year recertification.